Since 1934, C. K. Ogden's System of Basic English has been widely recognized as a representative subset of the English language. This project draws upon the existing studies of associative networks to encode the 850 words of Basic English into four hierarchical systems, physical, animal, human, and economic. 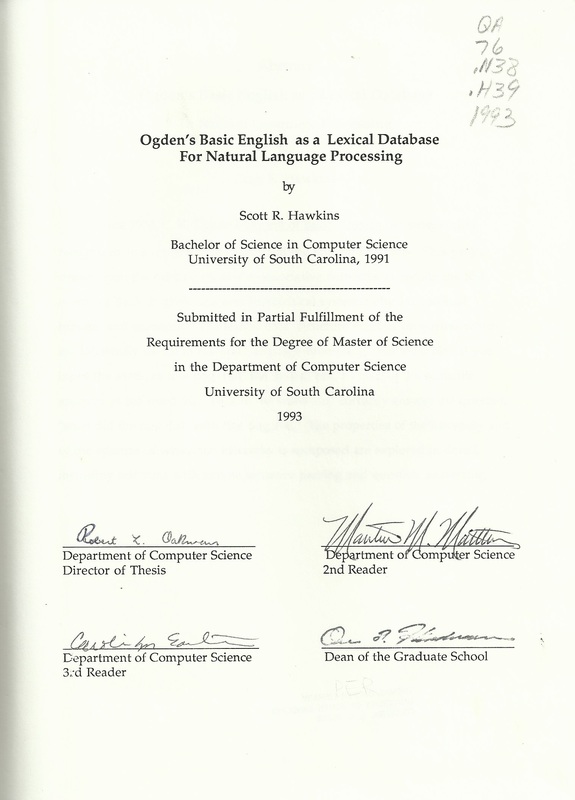 The lexical data structure exhibits properties which are inherently useful in Natural Language Processing. For example, if you input the sentence 'the dog run' the system can, by tracing the semantic ancestry of the word 'run' back to the word 'do,' correctly answer the question 'what did the dog do?' with 'the dog run.' The properties of the hierarchy and of the systems of which the hierarchy is composed are explored in detail, including test runs with simple sentence parsing and question answering. Web page is underdevelopment, it located in two locations which may create temporary confusions until joined into one -- 22Jan'15. Intent is to provide two versions of an existing thesis, (1) a summary for general audiance and (2) the complete thesis in web form with links to scans of complex pages. The complete form is being created first while waiting for the author's preference about making his work available. Of interest to Walter in Belgium, an independent researcher.